3685 Motor Ave Suite 240. The Cranberries have announced a 25th anniversary edition box set edition of their landmark debut album Everybody Else Is Doing It, So Why Can’t We? Originally released on 12th March 1993, the album hit the No.1 spot in both the UK and Ireland and sold over 6 million copies worldwide. Last year, the four members of the Cranberries – Dolores O’Riordan, Noel Hogan, Mike Hogan and Fergal Lawler – came together to plan this 25th-anniversary release. Everything was put on hold following O’Riordan’s untimely death in January this year, but now the remaining band members have decided to go ahead with the 25th-anniversary edition, which is released on 19 October on UMG, as a 4CD super deluxe box set and also a limited clear vinyl edition, among other formats. Keen to become a band themselves, the fledgling group met Niall Quinn, who became their singer in August 1989. They called themselves The Cranberry Saw Us. By March 1990, Quinn decided to leave the band to focus on his other band the Hitchers and his parting was entirely amicable. He played a pivotal role in introducing Dolores O’Riordan to the band and arranged an audition, which took place in Xeric Studios, an old industrial space in the middle of Limerick. Noel, Mike and Fergal were present with some of their friends when O’Riordan arrived. She carried a Casio keyboard under her arm and in stark contrast to the prevailing goth look (Doc Martens, black clothes, wild hair) which predominated in the small room, she wore a shiny pink tracksuit and had wet-look cropped hair. O’Riordan later recalled their first meeting: “I went upstairs and there were about fourteen adolescent boys in the room. The hormones were just rampant in there, the tension was deadly. I said: ‘Before anything happens can anyone who is not in the band please leave the room’.” Noel describes Dolores as “being as quiet as a mouse” that evening. Mike remembers: “She was introverted back then…but she still got up and had the guts to do it.” Everyone in the room was taken by her voice: “We were immediately blown away,” said Mike. “Her voice was something special.” Dolores recalls: “I really liked what I heard: I thought they were nice and tight. It was a lovely potential band but they needed a singer – and direction.” One of the instrumentals played by the Cranberry Saw Us that evening would soon become ‘Linger’, a relatively simple song that within two years would catapult the band to global stardom. 1991 was a crucial year for The Cranberries. On 18 April the band played a hometown gig as part of the University of Limerick’s Rag Week to 1,400 students – and 32 A&R men, most of who had flown in from London. In attendance was legendary record producer, the late Denny Cordell (1943-1995), who was then A&R for Island Records. Cordell didn’t offer the Cranberries the largest amount of money, but instead promised to look after the band and allow them the space to develop at their own pace. He clearly had a strong belief in their potential to succeed. Around this time the band shortened their name to The Cranberries. In 1992 the Cranberries took on a new manager in the form of the iconic Geoff Travis of Rough Trade and began recording their debut album with producer Stephen Street. Street brought with him a vast production resume as both engineer and producer (the Smiths, Morrissey, Blur) as well as expertise as a songwriter having co-written Morrissey’s first solo album Viva Hate (1988). For the Cranberries to be working with the producer of Strangeways Here We Come was a dream come true. By Christmas 1993, the band had toured extensively throughout Europe and the US and their return to Ireland was a triumphant affair. Their debut album had now clocked sales of over 800,000 copies in the United States and ‘Linger’ had reached number 8 in the Billboard Charts. It went on to achieve platinum sales status in the United States, Australia, New Zealand and the UK. It became a number one album in Ireland and the UK and peaked at eighteen in the US Billboard Charts. Thirty years after forming in Limerick (initially as The Cranberry Saw Us) The Cranberries are set to release their 8th and final album In The End. With Stephen Street once again taking producer duties, the eleven-track record brings a remarkable career to a fitting and powerful closure. Announcing the album, the band has shared the first single “All Over Now” that blends rock, alternative and catchy almost pop-sounding melodies to deliver a classic Cranberries sound. The Cranberries – Dolores O’Riordan, Noel Hogan, Mike Hogan and Fergal Lawler – emerged from the pre-Brit-pop scene of the early ’90s, with their trademark indie guitar sound and Dolores’ distinctive Celtic-tinged lilting vocal style – described by Melody Maker as “the voice of a saint trapped in a glass harp”. Their rise to global fame was nothing short of meteoric; best known for their now classic songs “Linger”, “Zombie” and “Dreams”, the band have sold more than 40 million albums worldwide. While it is tinged with sadness following Dolores’ unexpected death on January 15th, 2018, In The End is not a valediction, it is a celebration, one that stands as a powerful testimony to the life and creative work of Dolores and her brothers in music Noel, Mike and Fergal. The genesis of In The End began in May 2017 while the band were on tour. By winter of 2017 Noel and Dolores had written and demoed the eleven songs that would eventually appear on the album. “Dolores was so energized by the prospect of making this record and to getting back out on the road to play the songs live,” recalls Noel. In coming to terms with her tragic passing Noel, Mike and Fergal listened to the songs and, with the support of Dolores’ family, wanted to honor their close friend, and collaborator by completing the record. With the songs at various stages of completion they turned to Stephen Street – who had produced four of their previous albums including Everybody Else Is Doing It, So Why Can’t We? and No Need To Argue – and spent 4 weeks in a London studio building the sounds around her vocals from the original demos. “It was a bitter sweet time. The joy of recording new tracks is always exciting and one of the best parts of being in a band. At the end of every day when we’d laid down our parts there was a sense of sadness, knowing that Dolores wouldn’t be in that evening to work on that day’s track,” remembers Noel. Collaborating with award winning director Dan Britt, The Cranberries release the video for “All Over Now,” from the band’s final album In The End (available April 26th). “We thought animation was the way to go,” guitarist Noel Hogan tells Gary Graff from Billboardin an interview. The storybook-like visuals were the product of a collaboration with illustrator Tom Clohosy Cole (who created the backgrounds), and partly inspired by Eric Ravilious’ landscapes of the English countryside, which Dan describes as, “beautiful but stark and criss-crossed by barbed wire and the signs of human activity.” Rather unique colouring techniques using paper textures and watercolour brushes run through the flat animation giving the video a hand crafted feel. Taking inspiration from ‘In the end is my beginning’, a TS Elliot poem that resonates with the band, and by the song’s tale of an abusive relationship, the video sensitively visualises Dolores O’Riordan’s lyrics. “All Over Now” blends rock, alternative and catchy almost pop-sounding melodies to deliver a classic Cranberries sound that runs through the new album. In The End is not a valediction; it is a celebration, one that stands as a powerful testimony to the life and creative work of Dolores and her brothers in music Noel, Mike and Fergal. The genesis of In The End began in May 2017 while the band were on tour. By winter of 2017 Noel and Dolores had written and demoed the eleven songs, which would eventually appear on the album. “Dolores was so energized by the prospect of making this record and to getting back out on the road to play the songs live” recalls Noel. 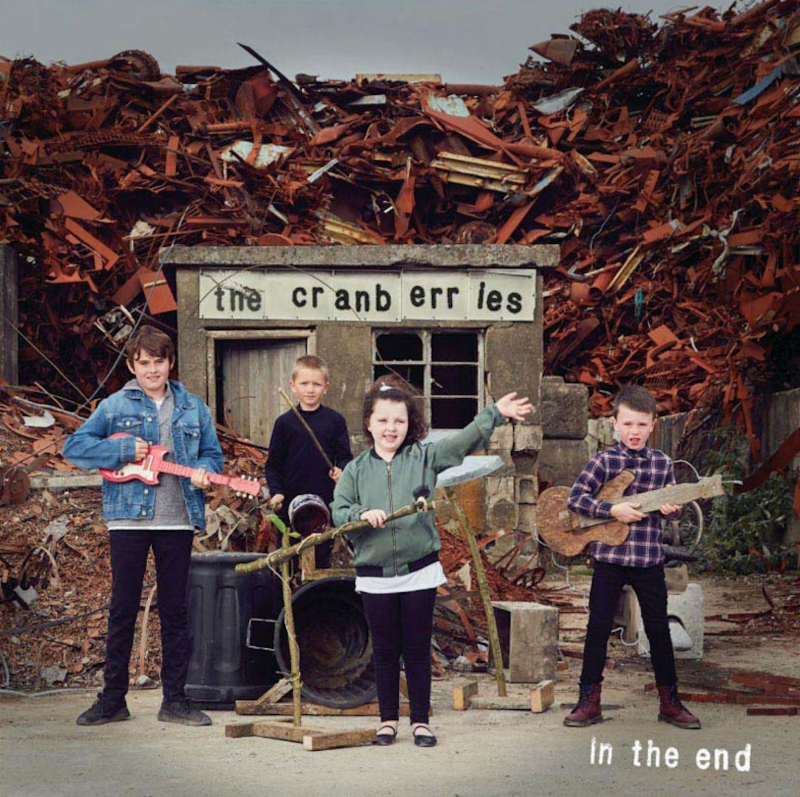 Mar 19 2019 The Cranberries Release New Single "Wake Me When It's Over"
While many bands may aspire to be timeless, or have a sound that transcends the whims of musical fashion, The Cranberries are one of the few to have achieved that. Play one of the Irish rock group’s early anthems such as “Linger” or “Dreams,” and they sound as fresh – and deliver as much of an emotional sucker-punch – as when they captured a generation’s hearts in the 1990s. Now, nearly 30 years after the quartet of singer/songwriter Dolores O’Riordan, co-songwriter and lead guitarist Noel Hogan, bassist Mike Hogan and drummer Fergal Lawler first appeared, they are returning with their eighth album In the End. After the sad and unexpected passing of Dolores on January 15th 2018, it will be their last – and is among the most complete works they have ever produced. As with all the songs on the album, the new single “Wake Me When It’s Over” had been recorded as a demo by Dolores before her passing. “This was a song Dolores had been working on for a little while” Noel explains. “It’s a fun song to play and it’s bright and quite uplifting. It’s very much a classic Dolores song with a soft verse and a massive chorus.” Working with Stephen Street – who had produced four of their previous albums including Everybody Else Is Doing It, So Why Can’t We? and No Need To Argue – the band built the sounds around Dolores’ vocals to create a classic Cranberries song. “It’s hard to explain what turns a Dolores tune into a Cranberries tune. It’s just the magic when we play together and understand each other so well. It’s always been the same” adds Fergal. The genesis of In The End began in May 2017 while the band were on tour. By winter of 2017 Noel and Dolores had written and demoed the eleven songs which would eventually appear on the album. “Dolores was so energized by the prospect of making this record and to getting back out on the road to play the songs live” recalls Noel. In the End sees the band coming full circle, with a collection that evokes their very first LP. “When we listened to the demos, the three of us and Stephen were thinking ‘this sounds much closer to the first album than anything else’. Dolores was singing very softly on some songs, which was closer to how she would have sung back then, and the simplicity of some of the songs as well brought us back to that time,” says Noel. As the huge wave of public adulation in the wake of Dolores’ passing showed, The Cranberries may be over, in one sense – but they will forever live on in the musical pantheon. As they prepare to release their final album, The Cranberries share the record’s title track “In The End.” The last song recorded for the album, and the last track on the album, it is an apt conclusion to a record that pays tribute to Dolores O’Riordan and brings to a close the band’s singular career. Was nothing like you wanted? Now, nearly 30 years after the quartet of singer/songwriter and musician Dolores, co-songwriter and lead guitarist Noel, bassist Mike Hogan and drummer Fergal first appeared, they are releasing their eighth and final album In the End. The genesis of In The End began in May 2017 while the band was on tour. By winter of 2017 Noel and Dolores had written and demoed the eleven songs, which would eventually appear on the album. “Dolores was so energised by the prospect of making this record and to getting back out on the road to play the songs live” recalls Noel. Produced once again by Stephen Street, In the End sees the band coming full circle, with a collection that evokes their very first LP. “When we listened to the demos, the three of us and Stephen were thinking ‘this sounds much closer to the first album than anything else’. Dolores was singing very softly on some songs, which was closer to how she would have sung back then, and the simplicity of some of the songs as well brought us back to that time,” says Noel. If there’s an overall lyrical theme, it’s a sense of wiping the slate clean, and new beginnings, which reflected where Dolores was, both in her personal and her creative life: re-energised and ready for a new phase. “I remember talking to her that summer and she said ‘I’m starting all over here’ and a lot of the songs discuss that,” says Noel. But, as ever with The Cranberries, lyrics that may derive from individual experience masterfully tap into universal emotions, framing them in terms that we can all relate to, whatever age, gender or nationality.